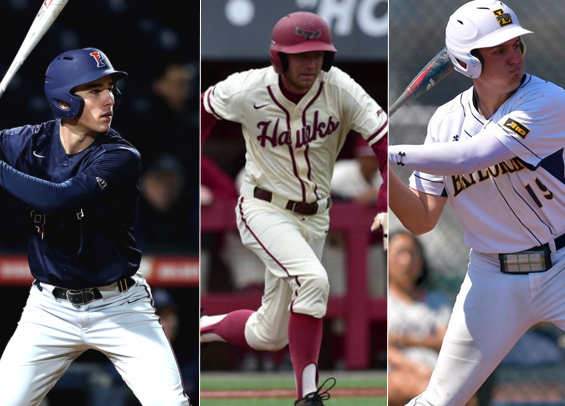 As conference play for most clubs is in full swing, now is an excellent time to take a look at some of the region's top performers through the first half of the college baseball season. Catcher: James McConnon has been a steady force for Saint Joseph's behind the plate and has been the most productive backstop in the city at the D-I level. He's hitting .315 and is second on the Hawks in RBIs with 14. First base: Sean Phelan leads a Penn offense that remains one of the hottest in the nation. His 25.1 runs created is the highest mark in the city, and his OPS is an outstanding 1.243. His .418 batting average is the best in Philly at the D-I level. Second base: Craig Larsen is one of several impressive freshmen at the D-I level this season in Philly. His 25 RBIs is second best in the city, plus he's hitting .375 for the Quakers. His 20.9 runs created is bested only by his teammate Sean Phelan. Shortstop: Josh Hood joins Larsen to form perhaps the best keystone combo in recent Philly D-I memory. The freshman is hitting .373 on the year and has two homers to go along with 16 RBIs. He leads all D-I Philly players with ten doubles on the season. Third base: Kevin McGowan was one of the hottest hitters in the country for a stretch earlier this month. He's hitting .354 on the season with 15 RBIs and three stolen bases. His hot bat is one reason why La Salle has gotten off to such a great start. Right field: Ben Faso entered the season recognized as one of the best D-I players in the city and nothing has changed. He leads the Explorers with 15.4 runs created, his 27 RBIs leads all Philly D-I players, and he has eight doubles to go along with four homers. Center field: Nick O'Day has put together a fantastic freshman season so far with the bat, hitting .301 with an OPS of .852. He also has four steals and a homer. Left field: Eduardo Malinowski is piecing together a solid sophomore campaign, hitting .309 with a homer and 16 RBIs. He's also swiped three bases. Designated Hitter: Nick Lorusso has been a bright spot for Villanova this season as a freshman, hitting .315 to go along with two homers and 13 RBIs. He's also worked 15 walks in 21 games and has a .889 OPS. Utility: Andrew Cossetti: Another freshman making a name for himself on the Philly scene, he leads the Hawks with three homers and 18 RBIs. He's hitting .304 on the season with 14.5 runs created. We'll unveil our mid-season pitching honors for the D-I level on Tuesday.